In this series of vSAN, In last post we have successfully configured the vSAN cluster. 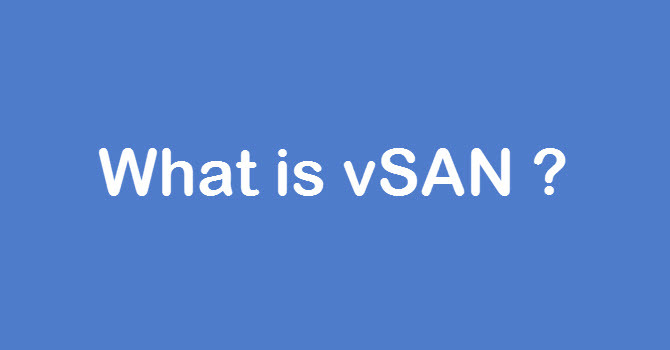 If you haven’t configured vSAN or don’t know much about vSAN then suggest you to check the links at the end of this post for more details on vSAN. 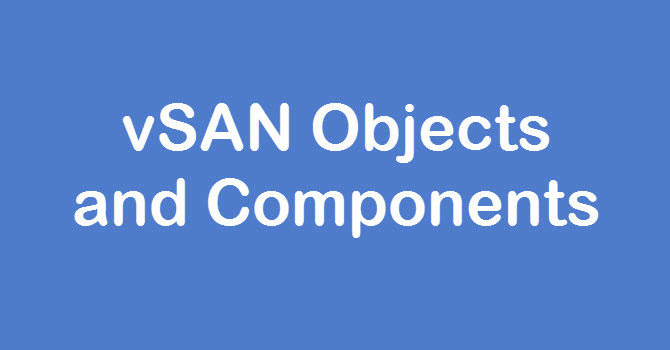 In this post we will look at How to run vSAN Proactive Tests. First What we need to know what is proactive tests. Proactive tests are the predefined configurations of automated tasks which executed on the vSAN Cluster for testing and performance guarantee. It is always recommended to run the Proactive Tests first after configuring vSAN so that you will come to know if there is any issues related to configuration or any issues related to hardware or software. 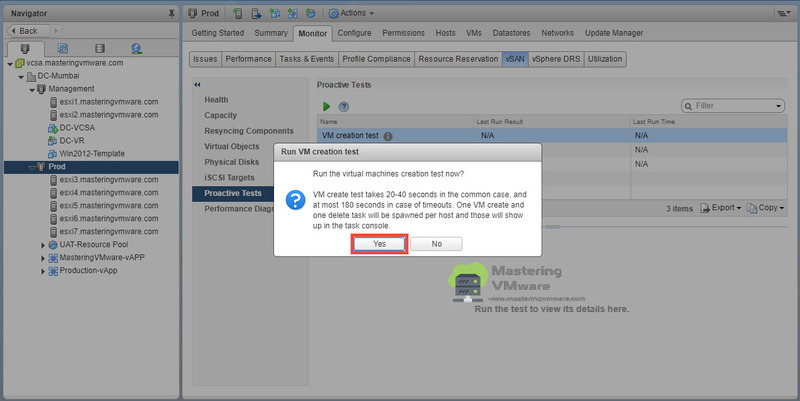 VM Creation test will automatically create a VM’s on each host which are in vSAN. 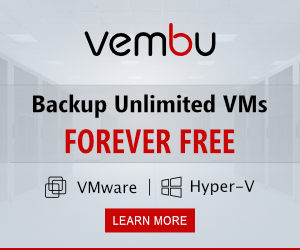 Once the test is successful VM will be deleted without manual intervention. Use of this test is mainly to know about working of the vSAN with regards to VM creations so that one can easily say that vSAN is operational and management stack on all the hosts are operational. Creation and Deletion of the IO is working and many more benefits are there. So if you get any failure you can easily identify before deploying your production VMs. 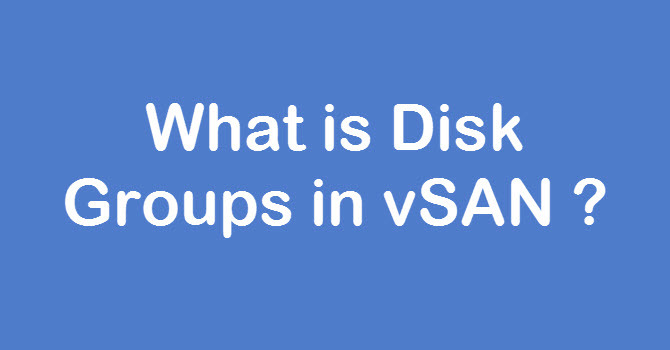 vSAN uses the local storage disks to form a logical datastore out of it. 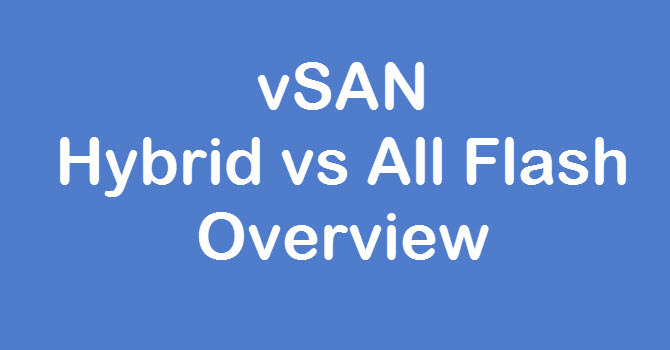 vSAN provides Hybrid as well as All flash mode configuration. Storage performance test will provide the multiple options from basic to IO intensive stress tests where your vSAN will be tested for the performance related issues. Based on the results of this test you can measure the performance of vSAN Cluster and take decisions. Go to Monitor Tab> vSAN. Click on Proactive Tests and select the VM Creation test. Run the test by clicking on green triangle icon. You will get prompt for the Tasks which will be performed. Click Yes to run the test. 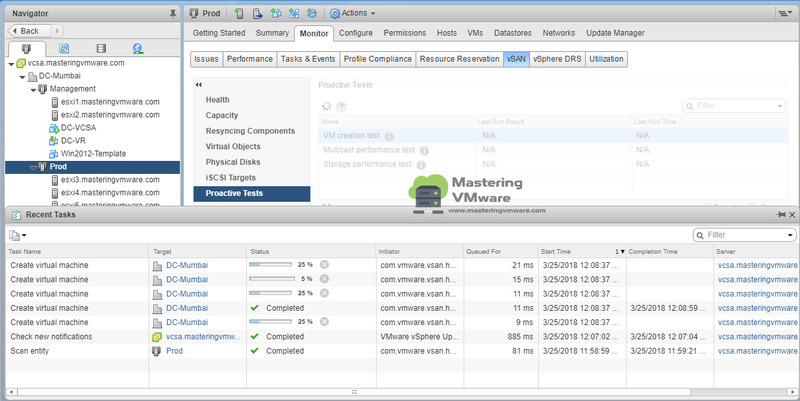 You can monitor the Recent Tasks tab to know about the VM Creation test. It will take few minutes to complete the test. Once test completes you will see details of the test results. As you can see that the test completed successfully. Using this way you can easily run the other 2 tests which are Multicast Performance Test and Storage Performance Test to get the know about your vSAN Configuration. Once all the tests passed successfully then you can easily go for vSAN production use.